I’m very lazy and tend to not be at all bothered at making rice exciting – just boiling it with a little salt is usually all I manage. I was a little annoyed that this called for finely chopped anything, let alone onion, which, I don’t know if you’ve noticed, make me weep more thoroughly than anything else in this world, but by the time I noticed the onion it was too late and I had to continue. There’s nothing quite so disturbing for one’s guests as the sight of the hostess weeping copiously over a chopping board. Anyway, tears aside, this recipe turned out well – more water was added as the rice was burning somewhat, but that’s the only deviation I made. 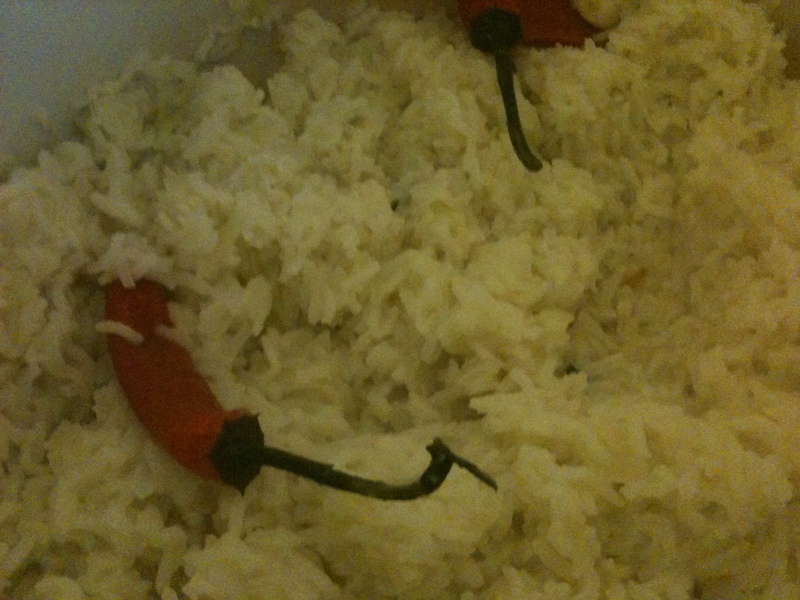 What resulted was quite sticky rice that was reasonably spicy. I would make this again. As an aside I’m beginning to recognise that these Sainsbury’s cookbooks are really decent resources – very solid, easy family recipes. Well done Sainsbury’s. 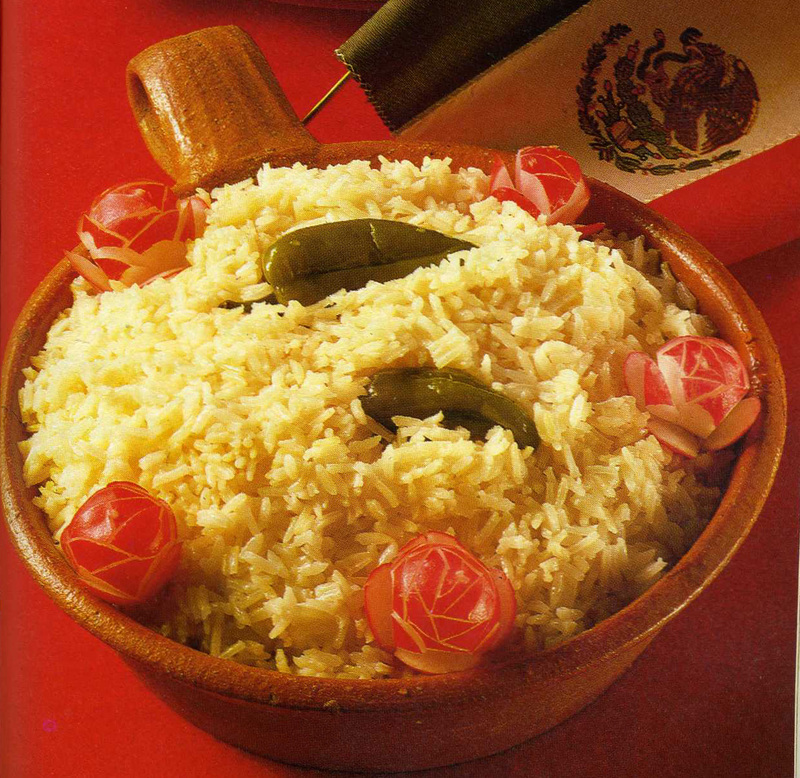 (Photos of rice, unsurprisingly not that exciting). 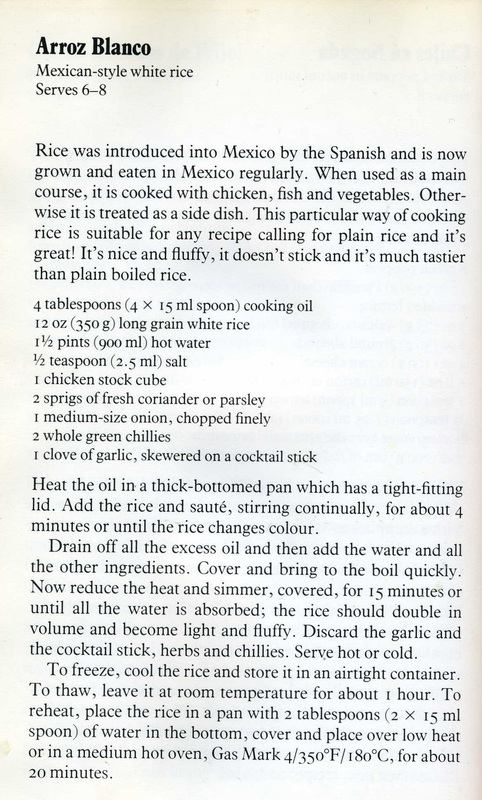 This entry was posted in 1980s, Cooking the Mexican Way and tagged chilli, garlic, onion, parsley, rice. Bookmark the permalink. I wonder whether Sainsburys does any own-brand cookbooks these days, considering how much profit there is for them in ready meals.